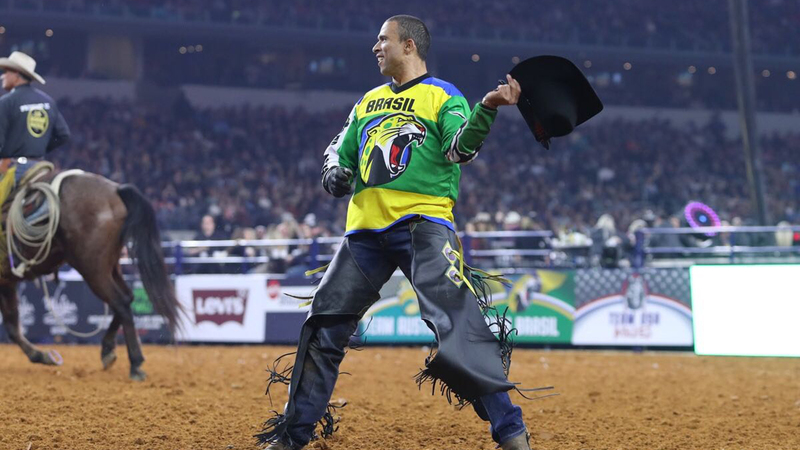 ARLINGTON, Texas – There is no denying the confidence and swagger Team Brazil has this weekend at the WinStar World Casino & Resort Global Cup USA, presented by Monster Energy. It was there long before Jose Vitor Leme lit up the scoreboard for the first 90-point ride in Global Cup history in the Bonus Round Saturday night with 90 points on Frequent Flyer. The scene was all too familiar. Leme being mobbed by his teammates on the back of the chutes was just like so many other historic Brazilian moments inside the massive football stadium located at One AT&T Way in Arlington, Texas. AT&T Stadium may be known as the home of the Dallas Cowboys, but for Team Brazil it is the house of Brazil. Four of the last five PBR Iron Cowboy champions at AT&T Stadium hail from Brazil, and that green and yellow dominance was on display Saturday night once again at the first Global Cup on U.S. soil. Team Brazil ended the first night of the Global Cup USA competition three bulls ahead of the Team USA Eagles and Team USA Wolves. The South American bull riding power enters Championship Sunday in control of its destiny as it looks to win a second consecutive Global Cup championship. Leme made the highlight reel to cap the evening, but it was veteran Eduardo Aparecido leading the way for the Brazilians. Aparecido began with 82 points on Constant Sorrow before converting on Uncle Gangster for 88.5 points in the Bonus Round. Fans can watch the conclusion of the Global Cup USA exclusively on RidePass at 1:30 p.m. ET. Aparecido said on Thursday at the team check in that he and his Brazilian teammates were talking about their country’s dominance at AT&T Stadium. The 28-year-old won the 2017 Iron Cowboy competition. Aparecido is now 9-for-19 at AT&T Stadium. “I joked with the guys Wednesday that all the Brazilians do well in this arena and we can do it again,” Aparecido said. Aparecido said Team Brazil is motivated every time they come to Arlington because of the big stage, the added money and the energy of the crowd. He said the group takes tremendous pride in winning the toughest competitions in the PBR. “It is just like the biggest, toughest one to win, and all the Brazilians like to win the toughest ones,” Aparecido said. “In this one, if you win, you earn it. Team Brazil coach Renato Nunes tried to downplay his team’s prior success inside AT&T Stadium, but he certainly believes his team is trying to show they are capable of riding the rankest bulls in the PBR. Brazil finished night one 7-of-9. The only two riders to buck off were Leme (6.37 seconds on Wicked Stick) and Claudio Montanha Jr. (6.97 seconds on Saint Joe) in Round 1. The rest of the team heard the 8-second buzzer – Bruno Scaranello (87.5 points on Swamp Wreck), Fernando Henrique Novais (85.5 points on Uncle Keith), Kaique Pacheco (83.5 points on Taco Cat) and Marco Eguchi (79 points on Stars & Stripes). Team Brazil will also be inserting alternate Joao Ricardo Vieira into their lineup on Sunday for Pacheco, who is not competing because of a knee injury, according to the PBR competition department. Vieira is Mr. Iron Cowboy himself. The No. 2-ranked bull rider in the world has won two Iron Cowboy titles and RFD-TV’s The American inside AT&T Stadium. He is a combined 10-for-21 in Arlington. Brazil certainly came out of the gates firing on all cylinders, and Nunes does not expect his unit to take its foot off the gas Sunday either. The 2010 World Champion says the Brazilians have a job to finish before they can do any celebrating.